Drinking unlimited wine daily in Stellenbosch had to sadly come to an end (but whyyyy)- Jess and I moved into a hostel in Cape Town to explore the city. Cape Town is the shiz. 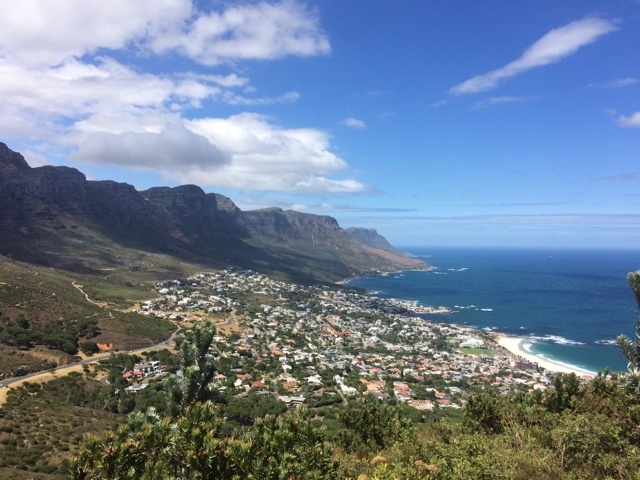 One of South Africa's main cities, known as the "Mother City," and one that played an important part in modern South Africa. Seriously, it is one of the prettiest cities I've ever seen in in my entire life. The city lies on the coast (and curves into a peninsula), so there are innumerable gorgeous beaches - some of its beach towns, you'd swear you were in Nantucket; and others, Miami. They range from fabulous and cosmopolitan and ritzy, to laid-back and small-town and homey. Furthermore, the city is surrounded by craggy, huge mountain ranges - gorg. 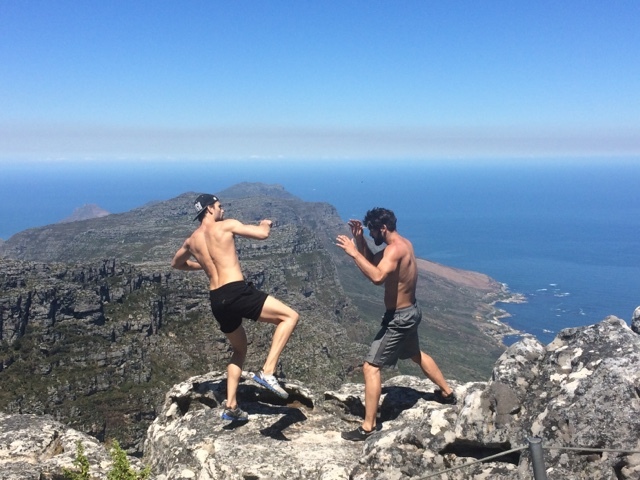 Add to that a dash of cosmopolitan, diversity, and never-ending activities, and I could have easily stayed there for our entire South Africa trip. 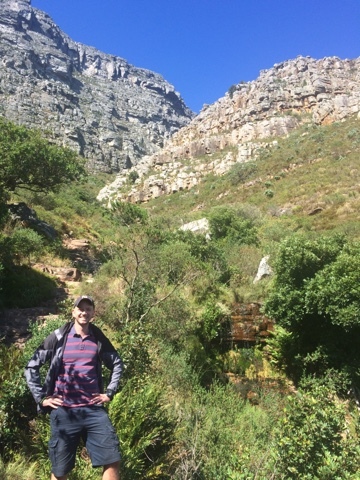 Our first day in Cape Town was wind city, so Jesse and I opted to go hike Lion's Head - one of the mountains that sits above the city. 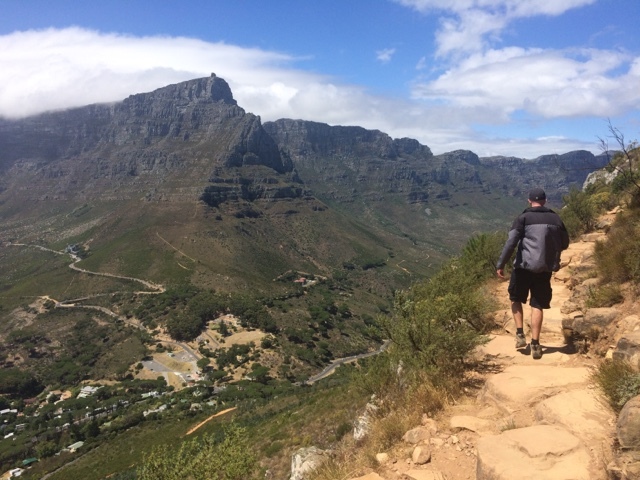 It's located right next to its more famous cousin, Table Mountain - but we'd heard the hike was cool and was a great place to view Table Mountain from (since they're basically neigbs and right next to each other). This was seriously the view at the start of our hike. 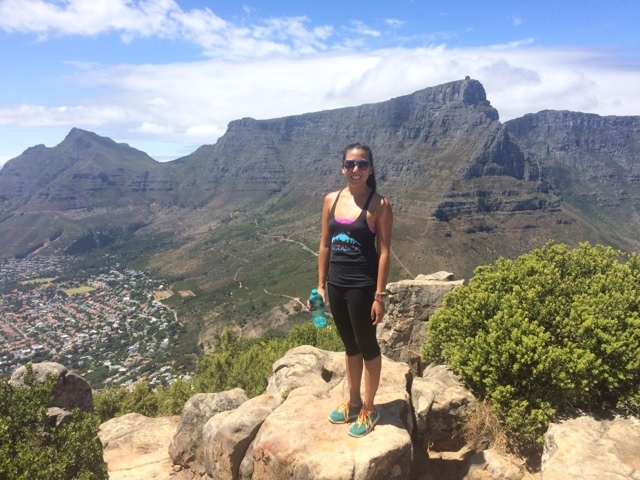 I'm tempted to say you don't even need to hike to the top of Lion's Head for the gorgeous views. Just walk for 5 minutes. Jesse marching along in his "sun jacket" (a nerdy jacket he wears when there's too much sun because he's scared of burning); Table Mountain to the left. 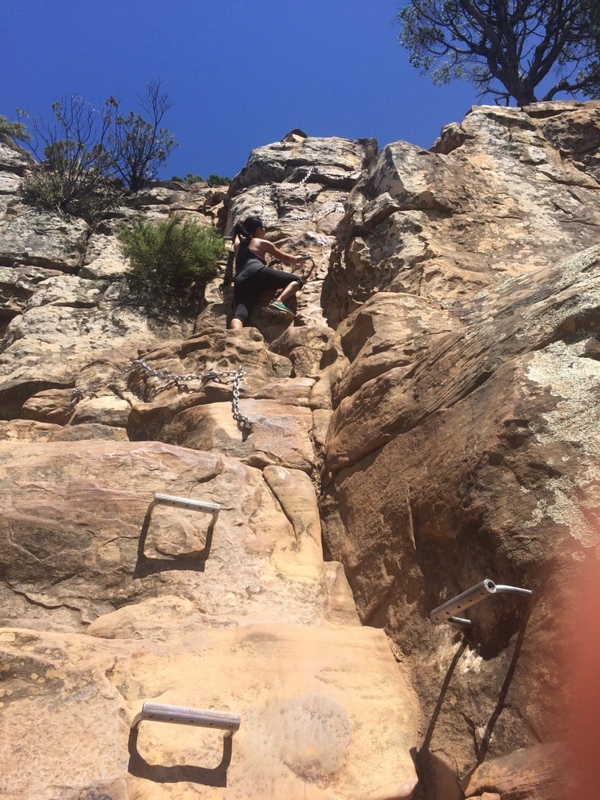 Near the top, you get to a sign that points you to a "recommended route" and another, more intense climbing route. Of course we took the climbing route (it was faster, and I'm all about efficiency)- which involved a lot of footholds, climbing, and heavy chains to scale up. 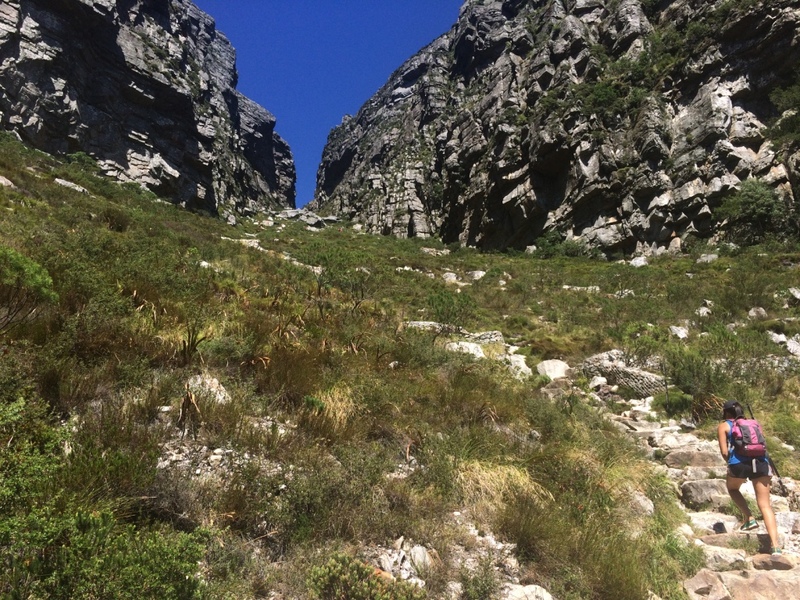 The summit of Lion's Head involves one last rock scramble to the very top. 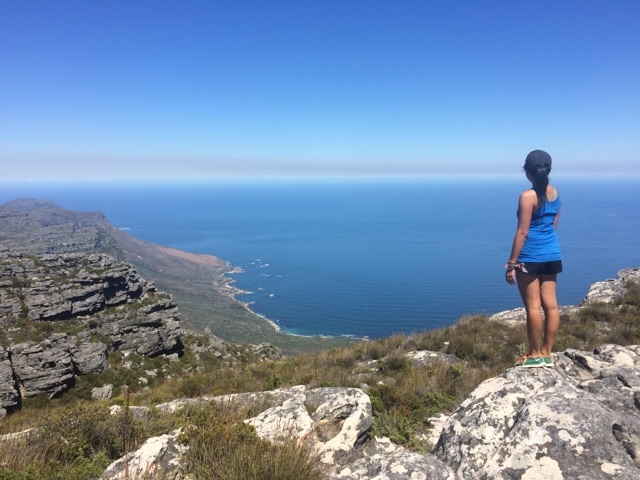 180 degree view from the top of Lion's Head; Table Mountain is in the middle; and ocean is surrounding both sides. 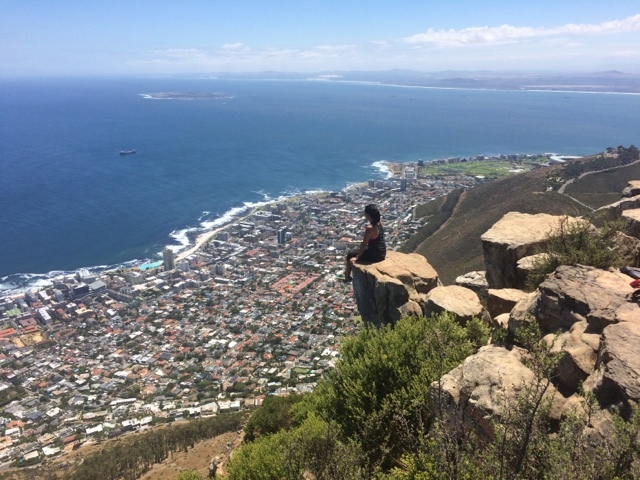 This is me, looking like a nerd, sitting on the other side of Lion's Head and looking over the city/ocean. 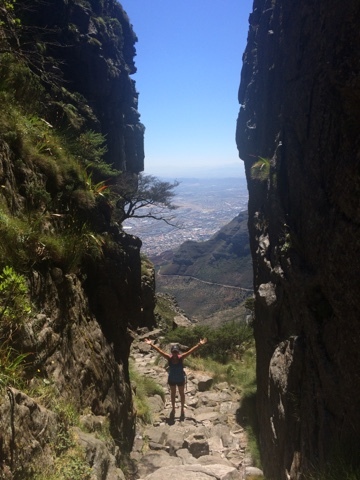 The best thing about Cape Town is its 360 degree views. Seriously, you can't find a bad viewpoint from any angle. 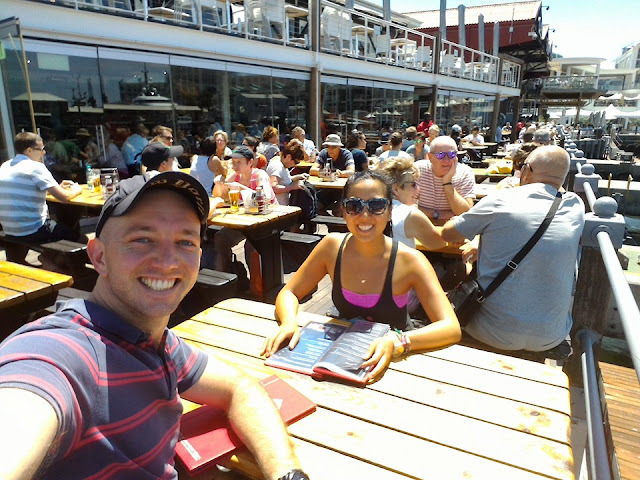 After our Lion's Head adventure, Jesse and I ubered down to the V&A Waterfront - it's a section of Cape Town that sits on the harbor, and is filled with shops, restaurants, tours, etc. It's a little bit of a tourist trap (SIGN ME UP), but is a great place to spend a meal and hang out. 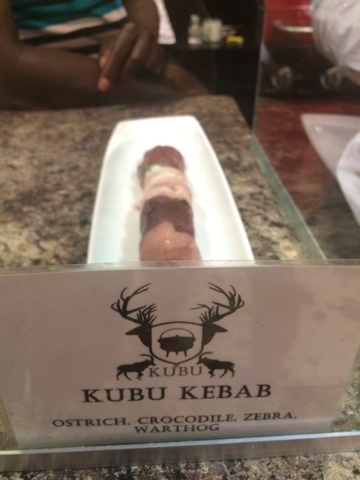 Just grabbed a quick kebab of exotic animals to share - the ostrich was kind of gross, but the crocodile is always my fave. V&A Waterfront, Table Mountain in the back (how many photos can I include Table Mountain in...?). 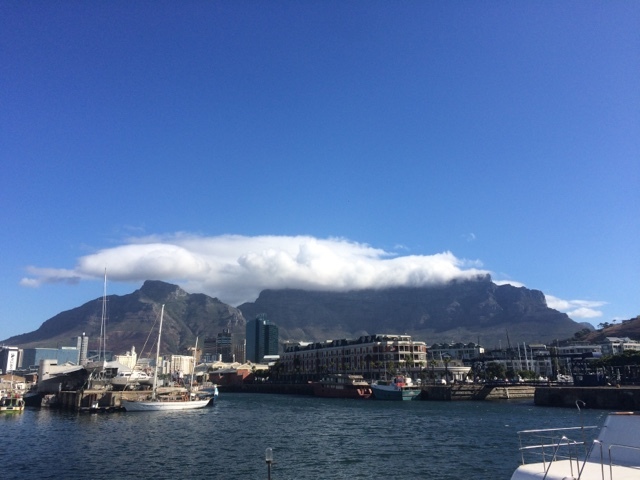 There's a phenomena when cloud cover covers the top of Table Mountain (like it is doing in this photo), which the locals call "the tablecloth." Um adorable. There are multiple trails up Table Mountain of varying difficulties; we chose one of the popular ones called Platteklip Gorge. I loved our hike; there were baby waterfalls and gorgeous views the whole way up. Also, please note the reappearance of the sun jacket. The hike took an hour and a half, and luckily it was super windy so not so hot. Winding between two giant rock mountains. You can see the road we started from far, far in the distance on the side of the mountain. 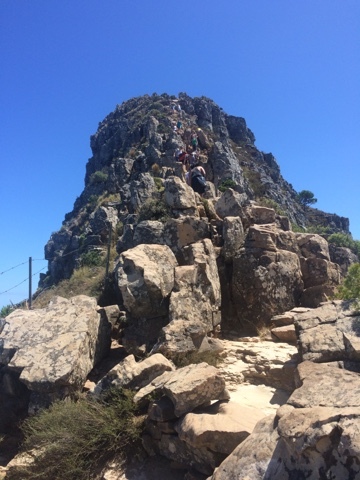 And then we made it to the top! 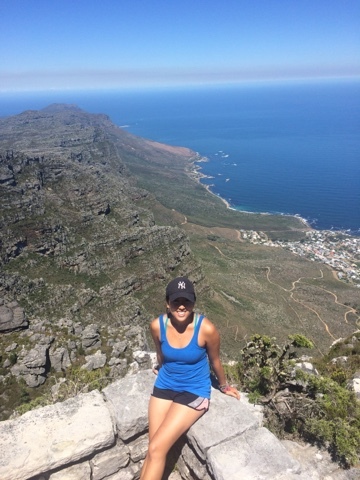 Here is the ocean from Table Mountain. Again, stunning views from every angle. Some kind of photo shoot was going on while we were up there, which involved shirtless men pretending to fight. 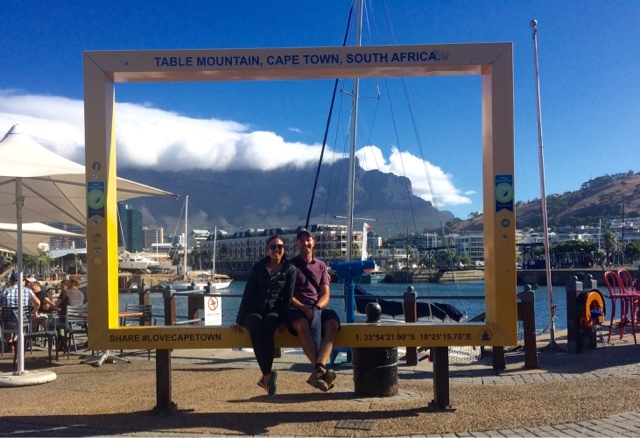 We had lunch at the cafe that sits conveniently atop Table Mountain, then headed back down by cable car (this way, you avoid the insane queues going up, but you don't have to commit yourself to a strenuous round-trip hike! Perfect). That evening, we met up with some more of Jesse's friends he'd met teaching abroad for a couple beers (he's taught in South Korea, Thailand, and Taiwan - so there's former teaching buddies everywhere). All around Cape Town are huge swaths of slums (and I mean HUGE - these things go on forever and ever), called informal settlements. When apartheid was big (which was terrifyingly recent), blacks were moved out of Cape Town and into their own neighborhoods. However, many of the job opportunities with better pay remained in the city. Instead of making the long, arduous commute (which often involved vehicles that they didn't have), it was more worth it for many blacks to slap together a temporary house on the outskirts of the city (since they weren't officially allowed to live there). These informal settlements were often torn down by police and were dangerous places to live, but it was still better than having to commute all the way home to the towns they were relegated to. It's a sad leftover from apartheid that tons of these settlements exist today: huge, sprawling, shanty towns made of aluminum siding, stretching out as far as the eye can see. South Africa has 11 official languages - it truly is a country of blended cultures and ethnicities, much of which can be attributed to Nelson Mandela's history of acceptance and tolerance for all.